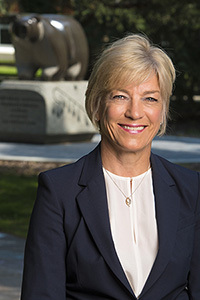 Dr. Cummings was appointed Dean of the Faculty of Nursing for a five-year term, effective July 1, 2017. Dr. Cummings is passionate about relational nursing leadership that empowers individuals, teams, and organizations to achieve shared goals. In the CLEAR Outcomes (Connecting Leadership, Education & Research) Research Program, we focus on building and disseminating a body of evidence about approaches to nursing and healthcare leadership that influence differential outcomes for the healthcare workforce, healthcare system and ultimately, for patients (including residents and clients) in the health system. Dr. Cummings is principal investigator of the Connecting Leadership Education & Research (CLEAR) Outcomes Program, which focuses on the development of leadership by individuals and organizations to achieve better outcomes for healthcare providers and patients. She is one of 3,215 Highly Cited Researchers in 2014, ranking among the top 1% most cited for their subject field and year of publication. 2016 – 2017	CIHR: Development of Quality Indicators for Older Persons' Transitions across Care Settings: A Systematic Review and Delphi Process ($100,000) Cummings GG (PI); Holroyd-Leduc J (co-PI); Anderson C, Estabrooks CA, Gordon D, Latoszek K, Reid RC, Rowe BH. 2012 – 2016	Provost for Research University of Sao Paulo, Brazil: Hospital management models and hospital accreditation from the quality improvement perspective ($170,000) Bernardes A, Silvia Gabriel C, Cummings GG, et al. Dr. Cummings supervises undergraduate and graduate students, and teaches leadership, policy, knowledge translation and research. She mentors graduate students interested in leadership, management policy and other organizational aspects of health care delivery that influence organizational, health care provider, and patient outcomes. In addition to graduate students, she supervises postdoctoral fellows and Honors undergraduate students.